The telecommunications industry has almost completed the evolution from a physical analog/digital network of copper wires carrying voice traffic to a more virtualized network of wireless services, IP transport and multi-modal messaging. As the physical network continues to evolve, the next generation of telecommunications service delivery platforms are emerging. CPaaS or Communications Platform as a Service has been born and is growing rapidly. As CPaaS itself evolves as a technology and a service offering, the initial mystery and confusion around what it means and what benefits it delivers has not diminished. To say that it is a disruptive technology is a huge understatement. Network integration of the CPaaS model is of key concern to Carriers and other telecom Service providers. The key variable; “Is CPaaS an existential threat to my business, or is it the opportunity of a lifetime?” Unfortunately, the answer to both questions is “yes”. Many Service Providers are currently struggling with these and other questions unique to a market that before today did not have CPaaS functionality available. Like most advanced network service offerings, CPaaS is now available in the cloud as a hosted application. 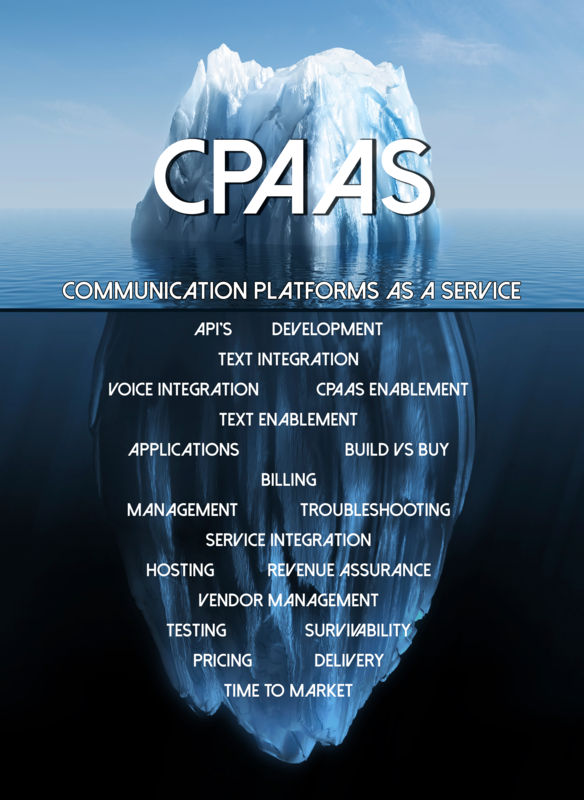 However, knowing how to access and leverage the benefits of CPaaS is just the tip of the iceberg. Service Providers must evaluate the new services that CPaaS enables in much the same manner as other more mature technologies have in the past. Integration will need to take place with legacy network infrastructure and operating systems, billing, support, and marketing. Voice, Video and Messaging will all need to be delivered in a timely manner, with the quality of service traditional telecom users are familiar with today. If this seems like a pretty daunting task, you are probably not alone. Luckily, the tools and services are becoming available to assist in these efforts. Watch for our next blog post in the “CPaaS is an Iceberg” series. We will be analyzing the benefits of CPaaS for Service Providers. These over the top services create new high margin products that leverage existing products and services. CPaaS enables new revenue streams while enhancing legacy services and the customer experience. Network Intelligence can help you make sense out of CPaaS. Network Intelligence provides analysis of Emerging technologies and their impact on Business Systems. Our Advice in Action approach allows you to acquire the information needed to determine if CPaaS is right for your application and how to go about implementing it.